Are you actually looking for ladies designer dresses? Well, we hope you are because the reality is that you have found our page on the topic. In this women's clothing section of the Apparel Search directory, you will find all sorts of interesting information regarding designer brand dresses for women. 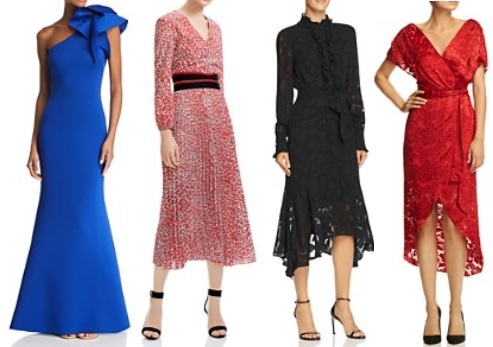 Welcome to the worlds greatest guide to Women's Designer Dresses. Are designer dresses better than regular dresses? Are they not "regular" dresses? Clothing design is the art of applying design, aesthetics and natural beauty to apparel. Designers conduct research on fashion trends and interpret them for their audience. Fashion designers attempt to design clothes which are functional as well as aesthetically pleasing. A dress is a garment consisting of a skirt with an attached bodice. It consists of a top piece that covers the torso and hangs down over the legs. A dress can be any one-piece garment containing a skirt of any length. Dresses can be formal or informal. Designer dresses are popular brand fashion that typically has the designer name on the label. Some dresses are made specifically for an individual, as in the case of haute couture or bespoke tailoring. An example of a fine maker of women's designer dresses would be Vera Wang. A fashion designer conceives garment combinations of line, proportion, color, and texture. While sewing and pattern-making skills are beneficial, they are not a pre-requisite of successful fashion design. Most fashion designers are formally trained or apprenticed. If the fashion designer does not have the skills of an illustrator, pattern maker, or technical designer, they can work with other designers to complete projects. A designer dress does not necessarily come from one individual. It is often a team of designers behind the completed product. A technical designer works with the design team and the factories overseas to ensure correct garment construction, appropriate fabric choices and a good fit. The technical designer fits the garment samples on a fit model, and decides which fit and construction changes to make before mass-producing the garment. Technical design is an important aspect of designing a dress for a specific individual or the mass market. A textile designer designs fabric weaves and prints for clothes and furnishings. Most textile designers are formally trained as apprentices and in school. A dress designer often will consult with a textile designer to be sure they are utilizing appropriate fabrics. They can also work together to develop new looks. Textile design is essentially the process of creating designs for woven, knitted or printed fabrics or surface ornamented fabrics. Textile designers are involved with the production of these designs, which are used in clothing. A pattern maker (or pattern cutter) drafts the shapes and sizes of a garment's pieces. This may be done manually with paper and measuring tools or by using a CAD computer software program. Another method is to drape fabric directly onto a dress form. The resulting pattern pieces can be constructed to produce the intended design of the garment and required size. A good pattern maker is extremely important for the development of a well fitting garment. Formal training is usually required for working as a pattern marker. You may be interested in learning about dress stores so you can shop for that perfect garment. Apparel Search is a leading guide to fashion, style, clothing, glam and all things relevant to apparel. We hope that you find this designer dress page to be helpful. What ever type of apparel you are wearing, is in fashion. If you want to be even more stylish, you should wear your favorite dress today. Don't forget to visit our Fashion Designer Directory section. Do you know the difference between a designer dress and a designer gown? Maybe their is no difference. Let's check in the fashion questions & answers section. Learn the difference between a dress and a gown if you are intererested.